It began as an ordinary December day. People were gathered around the radio listening to a football game or planning holiday parties, not girding for battle. But on Dec. 7, 1941, when the first Associated Press report came over the radio at 2:22 p.m. Eastern Standard Time of a “bombing in Hawaii,” the news was electrifying. Seventy-five years later, every American living now who heard it then can still tell you exactly what he was doing when he learned of the Japanese attack on Pearl Harbor. My grandmother would never forget that day seventy-five years ago. Her first child died of pneumonia on that day. She came home from the hospital to turn on the radio just as they were announcing the bombing of Pearl Harbor. Not only had she just lost her baby, but also, she realized that she would soon lose her husband to the war as well. My grandfather fought in WWII and luckily he safely returned, and they had two more children, my father and my aunt. Pearl Harbor marked a watershed in the nation’s history and we knew it. What came after would be very different from what came before. It was the war that changed the world. “The Day of Infamy” thrust us into a conflict more than four years long that altered nearly every aspect of American life, large and small – from rationing gas and sugar to the harnessing of atomic power to the new role of women in the workplace. We united to defend our democracy. For more than 400,000, it would be the ultimate sacrifice. That is why it is so important to remember the 75th anniversary of Pearl Harbor and all the 70th anniversaries of World War II events that follow. 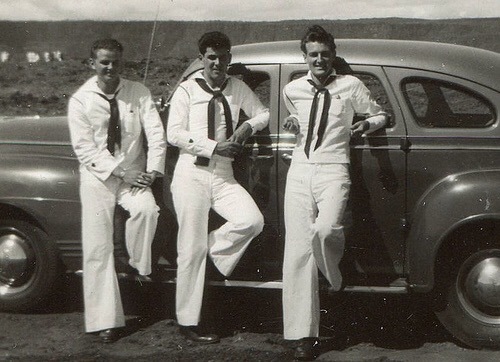 I will be commemorating the day by presenting a talk on the voices (oral histories) of Pearl Harbor. I hope my presentation goes well today. This entry was posted on Wednesday, December 7th, 2016 at 7:00 am	and posted in History. You can follow any responses to this entry through the RSS 2.0 feed.